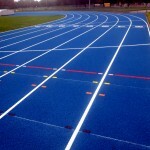 A Sandwich System Running Track is a hybrid of both the full PU track specification and the textured spray polymeric system as it combines the low cost base course material of the structural spray specification with the surface broadcast wearing course of the PU solid track system. The Athletics Track Sandwich System is hard wearing, durable and gives the characteristics of the solid PU track system at a cost saving price. The Sandwich System Running Track is non porous so does not allow rainwater through the system and stands out through its good transmission of forces and cost saving so therefore is a popular specification in the UK for quality athletics clubs and running track stadiums. The two layer Sandwich System Running Track consists of SBR base rubber crumb material mixed onsite with polyurethane binder and EPDM rubberized granules also installed insitu on site with polyurethane resin glue. The EPDM rubber crumb sink down into the SBR base mat and form a granulated surface as the wearing course cures hence the name of sandwich system. 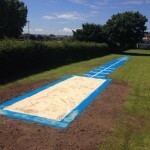 Athletics Track Sandwich System prices come in between the costings of a full PU track quote and structural spray polymeric surface and gives the high end playing characteristics as a middle of the range costing. 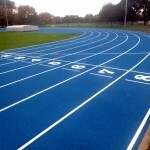 The Sandwich System Running Track meets both IAAF accreditation and UK Athletics which are the governing bodies in the sport of athletics so is a great surfacing product to have installed for running tracks because it is spike resistant and the possibly the best value specification for athletics surfaces.